You can subscribe now for $199 per month and can be canceled at any time. This is the first discounted price since the service started, act now. Grains: Funds bought 5,000 corn, and 6,000 soybean contracts, and sold 3,000 wheat on Tuesday. Grains are firm tonight on light volume. Whatever the report said, it continues its firm tone. Price movementtells you there was nothing there to propel either camp to push the market in their favor. Upside is limited by current resistances, yet the bears seem powerless. Massive supplies are weighing on the bulls, hard to sellsand at the beach. SA is well under way, and since the price action does not show concern of a shortfall downthere, does not bode well for the bulls. Our time is limited to export before SA is ready to sell its crop. All fundamentals do is to justify staying in a losing position. After you read the report did it tell you how muchreward you should seek (upside objective) and how much risk you might endure if the market goes downinstead? That is what you need to know, and only the charts are helpful in discovering what the price could bein the future. Most calls settled lower, taking out premium. The winners do not win and the losers get killed. Look at howcheap options are that expire next Friday. It tells you the market is going nowhere fast. 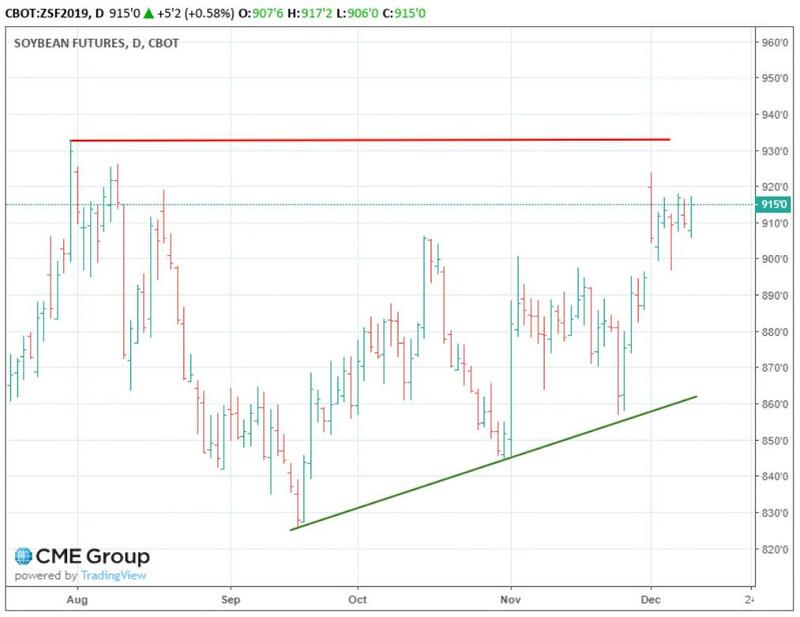 Charts remain the same and will offer more clues as the market adds more bars, for now corn and soybeansare closer to resistances, and wheat is wallowing in the lower bracket. I still recommend hedging or selling corn and soybeans against their bracket line resistance. Next major report is the Final Report in January, and until then looks for more sideways action, and do notlook for the next trend to start until at least that Final report is known.